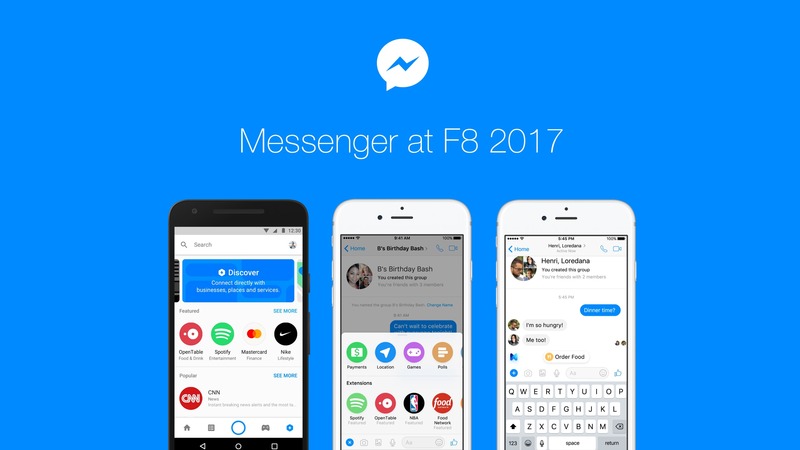 Facebook has released a whole lot of information from their latest F8 developer conference, and it looks like their drive to turn Messenger into its own platform for development is continuing full steam ahead. The conference started today and continues into tomorrow, but Facebook has already pushed out a number of press releases based on some of the things talked about there. Notable announcements include a Discovery tab in Messenger for finding more bots, QR code support, "Chat Extensions" that add bots into a group conversation, FAQ for bots, a VR demo, and more ways to use the M personal assistant. The focus at F8 this year seems to be on bots for Messenger, and Facebook's marketing team is pushing hard for us to associate Messenger, and the bots, with business. They started it when they rolled bots out at last year's conference, but they are stepping things up significantly by allowing them to work in group conversations under the new name "Chat Extensions." Facebook wants these bots to be your point of interaction with supported businesses in Messenger, and now you can summon them up in a conversation, or browse a curated list in the Discovery tab. Now, Facebook has been pushing these bots for a while, but they actually might end up coming in handy, at least on occasion. Think of them as an extension of the personal assistants already present in apps like Messenger and Allo, but with a different focus. It's not about the information you ask for, it's about the source. Instead of asking M or the Google Assistant when the last showing at the local theater is, you can ask the theater. But now with Chat Extensions that same utility can be applied to sharing content, too. You could do the two step procedure of asking for a recipe for mango-mushroom-marinara and then again asking to share that recipe with your aunt Mildred (who loves mangos), or instead you can just ask the FoodNetwork bot for that recipe in a conversation, and mango Mildred can see it at the same time. Couple that with the predictive features from M for dynamic suggestions and you might find yourself being recommended bots in conversations with friends fairly frequently, and for good reason. At a minimum it can save time. These tools also apply to games, with those bots and the new Rich Gameplay feature, which adds turn-by-turn games. Businesses also benefit from these features —after all, if you aren't paying for the product, you are the product. Facebook wants these bots to replace the yellow-pages for us, providing reviews, recommendations, business information, and FAQs all in an on-demand responsive package. Instead of searching and parsing information to answer your own questions, just ask the business. That's... actually kind of terrifying, so let's hope there's at least some degree of fact checking, since people left to their own devices aren't particularly likely to. 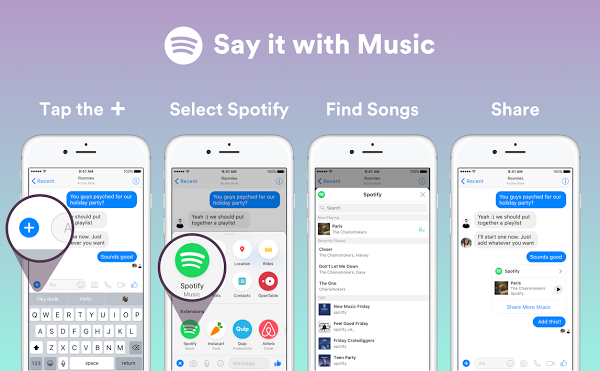 Notable mentions when it comes to bot support include Spotify, which now allows you to share music and listen to short clips in-app; Food Network, for looking up and sharing recipes; Yahoo and their Captain personal assistant, and the Wall Street Journal (@wsj, can we get a fact-check bot for conversations?). In other less-botty news at F8, Facebook is also rolling out beta VR support on the Occulus Rift for Facebook Spaces. For now it looks to be a pretty simple affair, you and your friends can hang out in a shared space, draw in the air, take selfies, and change the wallpaper. But, as more features and platforms are added the list of activities to do in VR might grow. In more developer-related news from the conference we have a new Developer Circles program for managing community involvement and interaction; ostensibly this is marketed for all tech, but it is likely focused on increasing developer involvement and engagement with Facebook's services. We also get the Places Graph (an easy method for developers to look up information for their apps), a new API for persistent identities between Facebook, Messenger, and third party apps, and we have new analytics tools for Facebook pages. This might seem like a whole lot to process, and it did even take Facebook over an hour just to introduce it all, but it basically boils down to: more bots in more places, developer tools, and a VR demonstration. If you do want all the dirty details, though, feel free to watch the whole broadcast below. Live at our annual F8 developer conference.